There are no other words to describe Roger Federer, but if you name him “legend” you can only be right. After six months out that made him slip out for the first time after 14 years from the top 10 ranked players, the timeless Roger Federer comes back and wins the Australian Open, the first Grand Slam of the season, and his eighteenth Grand Slam title in career. He surpassed an historic opponent, the great Rafael Nadal, after five intense and spectacular sets closed with the score of 6-4, 3-6, 6-1, 3-6, 6-3. The Swiss did not triumph in Melbourne since 2010. His last victory in a slam was obtained at Wimbledon in 2012. Federer and Nadal returned to compete in a Grand Slam final for the ninth time, but the first after five years and a half. Immediately after the match, the two protagonists have confirmed a great style in the words. I’d like to congratulate Rafa on an amazing comeback, Federer said, speaking to Nadal, I don’t think either one of us believed we were going to be in the finals of Australia when we saw each other at your academy four or five months ago. I would’ve been happy to lose to you. Tennis is a tough sport. There is no draws but if there were, I would’ve been happy to accept a draw tonight and share it with Rafa. I wasn’t sure if I was going to make it here so I want to thank you guys. the Swiss added, speaking to his team. Speaking to Federer Nadal said he’s “very happy” for him. It’s been a great month, the Spaniard said, speaking to spectators, For the first time in my career I’ve spent a full month here. It’s been an amazing month for me. I enjoy this beautiful country. I worked very hard to be here today. It was a great match and Roger probably deserved it a little bit more than me. I’m just going to keep trying. I feel like I am back at a very high level and I’m going to keep fighting to have a great season and for sure to come back here for many more years. I’m going to keep trying hard to have the trophy with me in the future. 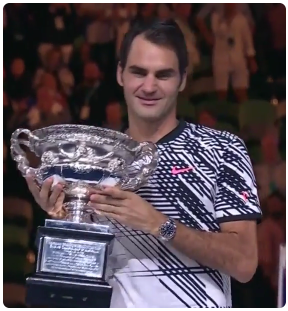 Before leaving the stage, he added, Now, I’ll let Roger get the trophy and… see you next year!